Hydrangeas, a staple in Southern gardens, thrive in USDA zones 3 through 9, depending on the variety. These deciduous shrubs produce breathtaking, enormous blooms in shades of white, green, pink, blue and red with glossy, dark green foliage. Hydrangeas, with an assortment of bloom types such as lacecap, mophead and oakleaf, grow best with partial shade in well-draining, nutrient-rich soil. 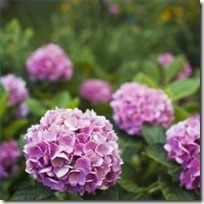 Mophead hydrangea varieties are unique in that bloom color can be changed by adjusting the pH level of the soil. Find a suitable transplant site. Hydrangeas need at least partial shade and nutrient-rich, well-draining soil to thrive and produce spectacular blooms year after year. Amend the new site with organic materials, such as compost, grass clippings or shredded bark and coarse sand to improve drainage and add nutrients to the soil. Work amendments into the soil at a depth of at least 10 to 12 inches. Dig around and under the root ball of the established plant to loosen it from the ground. Start digging several inches outward from the outer branches of the plant in order to preserve most of the root structure. Prepare the new site for transplant. Auburn University College of Agriculture recommends digging the new hole at least 2 feet wider than the established plant’s root ball and only as deep as that root ball is long, so that the top of the root ball sits even with the soil line. Situate the transplant into the new location and fill the hole in with the amended soil, packing it around the roots and patting it down to eliminate any air pockets. Water the newly transplanted hydrangea deeply, then cover the entire planting area with a 2- to 3-inch layer of mulch. Mulch helps the soil retain moisture and keeps diseases at bay. Don’t water again until spring arrives and temperatures are warmer. For colder northern locations, begin transplant preparations as soon as soil is thawed enough to work but before the established plant breaks dormancy for the spring. In warmer locations, transplants can be planted as early as January or February. Water transplanted hydrangeas evenly and deeply during the first year after transplant to help establish a healthy root structure in the new location. Hydrangeas will decline and produce fewer blooms if they are subjected to too much shade.